CrowdTangle now tracks public Facebook Groups. Use our Groups search function to find relevant communities of users talking about topics of interest to you; whether it's a geographic affinity, interest area, or fan group. Build a Facebook Groups List by going to any Facebook dashboard and selecting Lists > Create New. Choose "For Groups" from the prompt that appears. 2. Enter your search term into the bar to begin surfacing public Groups on Facebook, just as you would search for a Facebook page. You can also enter the URL for any public Facebook group to the search bar. 3. 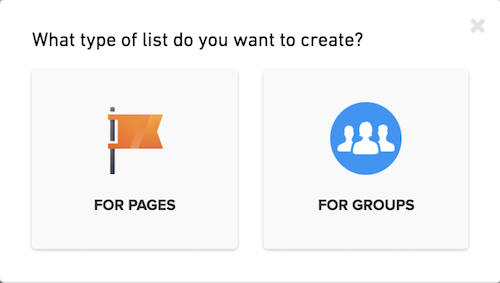 Select "Add to List" to build your Groups List and start discovering content within public Facebook Groups. Groups Lists will be separated and saved under your Page Lists in your CrowdTangle dashboard. Search for keywords within public Facebook Groups in the CrowdTangle database by going to Saved Search in any Facebook dashboard and selecting "Groups" from the drop down menu next to the search bar. 2. Surface public Groups sharing stories from your domain by setting up a Groups referral search. Go to Saved Search in any Facebook dashboard and selecting "Groups" from the drop down next to the search bar. Then, enter your domain and select "Save Search." 3. Saved Searches for Groups will be separated and saved under your Saved Searched for Pages in your CrowdTangle dashboard. ✦ Public Facebook Group Lists help you tap into audience generated conversations that are happening around major events, interest areas and communities. ✦ Public Facebook Group Lists make it easy for you to engage with targeted audiences around specific topics and interests. These targeted conversations are an optimal place to share relevant stories, discuss news information and generate story ideas. 1. How does Weights affect Groups? Weights works and operates the same for Groups as it does for the entire CrowdTangle system. We benchmark how many likes, comments and shares posts in Groups normally get over time, and show you how any new post compares to that average. 2. Will Browse Groups be available like Browse Lists? Yes. We've compiled a few lists of public groups by metro areas to help get you started. 3. How many Facebook Groups is CrowdTangle tracking? We are tracking 1,900 Groups and adding more every day. 4. Can Private Groups be tracked in CrowdTangle? No. When searching, you can only add public Facebook Groups. Note that Closed groups may appear, but we cannot access the posts from them. 5. When I click on the member’s name who posted content what happens, and can I see their profile? When you click the member's name a tab will open up with their profile, but you won’t be able to see anything beyond that unless you’re friends with them or their profile is public. 6. How do I see how many members are part of a Group? You can see the number of members when you utilize the Search for Groups. Members are displayed below the Group name. You can also view member counts by going to the Leaderboard for any Groups List in your Facebook dashboard.